Worcestershire spinners Sachithra Senanayake and Alexei Kervezee shared seven wickets to put their side in contention for a first LV County Championship win of the season against Sussex at Hove. Sri Lankan Senanayake picked up 4 for 50 but it was Kervezee, in a 15 over spell either side of lunch, who was their unlikely hero as he claimed the first Championship wickets of his career as Sussex were dismissed for 290 in their second innings. It left promoted Worcestershire needing 247 to win and they will resume their chase on 47 for 0 after Daryl Mitchell and Richard Oliver negotiated 14 overs before stumps. While Senanayake mopped up the tail effectively, it was off-spinner Kervezee, who bowled just 7.3 overs in the Championship last season, who made the crucial incisions with the prized scalps of top scorer Ed Joyce, first innings centurion Matt Machan and Luke Wright. There were periods during an absorbing third day when Sussex looked capable of posting a target in excess of 300, particularly when skipper Joyce and Machan added 119 for the second wicket after the out-of-form Luke Wells fell to Charlie Morris in the second over of the day. Machan made the most of an early reprieve, when he was dropped at second slip by Tom Kohler-Cadmore on four, to follow his first-innings career-best 135 with 55 off 79 balls including six fours. Kervezee’s only two previous first-class wickets had been for Ireland in 2008 when he bowled medium pace. But on a pitch offering turn and some erratic bounce he proved more than useful with his off breaks, breaking the stand when Machan played across a quicker ball and was lbw. Morris removed Craig Cachopa for a duck with the second ball after lunch before Kervezee ended a promising innings by Wright with a ball that bounced alarmingly and was fended into the hands of short leg by the surprised batsman. 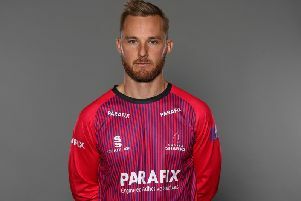 Kervezee then claimed the key wicket of Joyce, who had progressed serenely to 82 from 149 balls with seven fours and a pulled six off Jack Shantry. His delivery turned enough out of the rough to take the edge as Joyce went to drive and Kohler-Cadmore held on to a sharp chance at second slip. Ben Brown looked in good form until he played all around Shantry’s inswinger for 44 and it was left to Senanayake to mop up the tail after tea when he took the last four wickets. Ashar Zaidi and Tymal Mills were both taken at leg slip and Steve Magoffin at slip before Ajmal Shahzad, who had just lofted Senanayake onto the top deck of the pavilion for six was bowled around his legs for 35. With Mills unable to bowl because of a back problem Magoffin and Matt Hobden were charged with trying to make inroads and although both got the occasional ball to climb off a length, Mitchell and Oliver stood firm to give their side a great chance of their first victory since promotion. Alexei Kervezee made the most of his “surprise” call-up into the Worcestershire attack to give his side the chance of a first Championship victory since promotion against Sussex. The 25-year-old only switched from bowling seam to off spin this year but took advantage of favourable conditions to remove Ed Joyce, Luke Wright and Matt Machan – his first Championship wickets – as he took 3 for 72 from 20 overs. He said: “I must admit it was a surprise when (skipper) Daryl (Mitchell) asked me to bowl and I was delighted with how it went. “I have tried to bowl a bit quicker and there was some rough to aim for and I’m pretty chuffed to have got Joyce and Wright out – they are not a bad couple of scalps for my first Championship wickets. Sussex were dismissed for 290 in their second innings and Worcestershire reached 47 without loss at stumps and need 200 on the final day for victory, although Wright still believes his side have a chance. “We would have liked to set a few more but we’ve seen that the odd ball does something out of the ordinary and we’ve seen throughout the game that wickets do fall in clusters,” said Wright.